Landing gear component, attached with fluoroelastomer adhesive, plays a key role during flights of the Atlantis. Because of its exceptional heat resistance, good thermal stability and low outgassing properties, Viton fluoroelastomer has been called on for a variety of assignments aboard the National Aeronautics and Space Administration’s (NASA’s) fleet of reusable space shuttles. Since the shuttle program began flying in 1981, solid rubber components made from the high-performance elastomer have been used in sealing applications ranging from the shuttle’s solid-fuel booster rockets to its triple-pane cabin windows. This case history spotlights an equally critical application for a product made of liquid Viton – a premium-grade adhesive that is used to bond a key component of the shuttle’s front landing gear. Our story begins in October 1996, when the Shuttle Atlantis was being readied for its first docking mission with the Mir space station. The Shuttle Atlantis had just returned from its 17th flight, a 10-day mission, and crews at the orbiter processing facility at Kennedy Space Center were busily inspecting and refurbishing the vehicle for its next scheduled flight in early 1997. Simplified diagram of the shuttle’s nose landing gear showing the upstop bumper pad attached to aluminum frame with adhesive of Viton™. The elastomer-to-metal bond is under compression throughout the mission until the shuttle’s wheels are lowered for landing (dotted lines). Wheels are lowered as the Space Shuttle Atlantis touches down at Kennedy Space Center after a successful rendezvous with the space station Mir in January 1997. The single landing gear at the nose of the craft spent the entire 10-day mission compressed against an upstop bumper assembly bonded with liquid adhesive of Viton® (see drawing). While the shuttle’s retractable nose landing gear was being serviced, a small part on the wheel assembly was found to be missing. The part was a 2-in. by 2-in. elastomer pad called the upstop bumper: the adhesive that held it in place had failed either during the flight or while crews were servicing the landing gear. “The bumper simply detached from the structure,” said Marcy Solomon, materials engineer for the Boeing Company, NASA’s design and engineering integration contractor for the shuttle program. But rebonding the upstop bumper on the Atlantis required a very special type of adhesive, according to Solomon. “The adhesive for attaching this important part has to meet a very tough performance spec,” she explained. The specification used by Boeing was written to ensure reliable performance in space, as well as during take-off and landing of the shuttle. The cured adhesive is required to withstand temperature extremes (from -60°F to +450°F [-51°C to 232°C]) and to provide a shear strength of 750 psi at the coldest end of the scale. Bond strength and durability – as well as a long shelf life – were other key requirements. The answer was in product evaluation work that had been done by Boeing more than a year earlier. 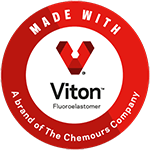 In mid-1995, Boeing engineers had requested a sample of PLV-2100, a liquid adhesive made from Viton™ fluoroelastomer by Pelseal® Technologies, a Bensalem, PA company. Boeing had tested the high-performance adhesive and had approved it for rubber-to-aluminum bonding applications. Now, faced with the urgent need to rebond the upstop bumper before the next launch, a call went out to Pelseal. “The good news came back that we could get the adhesive right off the shelf…without waiting,” said Solomon. Ross pointed to a long list of successful applications for PLV adhesives, including gasketing industrial ovens, coating chemical equipment, repairing jet engines and splicing rubber belts.